In addition, the brand, which was launched in 2008 and currently features more than 300 products in 60 categories ranging from fresh produce, dairy and meat to cereals, pastas, snacks and baby foods, is expanding its product lineup in 2015 and will be introducing nearly 200 new items this year. As part of the brand refresh, Wild Harvest will shift to new “free from” messaging that addresses consumers’ desire for clearer ingredients statements. All Wild Harvest products are free from more than 100 undesirable ingredients, including artificial and synthetic ingredients, and nearly 70 percent of its products are certified organic by the U.S. Department of Agriculture (USDA). New Wild Harvest cereals, appetizers and veggie burgers. The Wild Harvest brand refresh brings subtle visual changes to the logo and packaging that make it easier for shoppers to find Wild Harvest products throughout the store. The updated logo delivers a positive, clean aesthetic that calls to mind the warmth of the sun and nature, and the product packaging redesign features bright new graphics with a vibrant field of green reminiscent of fresh grass. The refreshed design helps convey that any flavors or colors added to Wild Harvest products are derived from natural, not synthetic sources. Each product package also will prominently display the new “free from” messaging. In addition, the Wild Harvest website has been updated to coincide with the brand refresh. 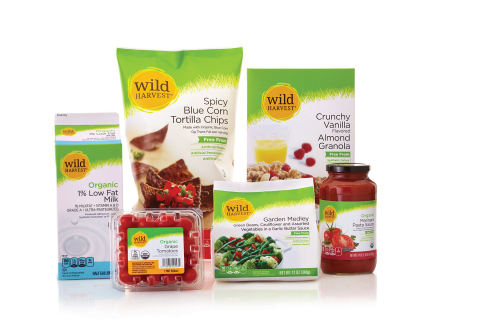 Wild Harvest products are available at SUPERVALU retail banners, including CUB Foods, FARM FRESH FOOD & PHARMACY, HORNBACHER’S, SHOP ‘N SAVE and SHOPPERS FOOD & PHARMACY, as well as independent local grocery retailers nationwide. For further information and to find a local retailer carrying Wild Harvest products, visit www.WildHarvestOrganic.com or connect on Facebook at www.Facebook.com/WildHarvest. SUPERVALU INC. (NYSE:SVU) is one of the largest grocery wholesalers and retailers in the U.S. with annual sales of approximately $17 billion. SUPERVALU serves customers across the United States through a network of 3,360 stores composed of 1,832 primary stores serviced by the company’s food distribution business; 1,333 Save-A-Lot stores, of which 911 are operated by licensee owners; and 195 traditional retail grocery stores (store counts as of Nov. 29, 2014). Headquartered in Minnesota, SUPERVALU has approximately 35,000 employees. For more information about SUPERVALU, visit www.supervalu.com.